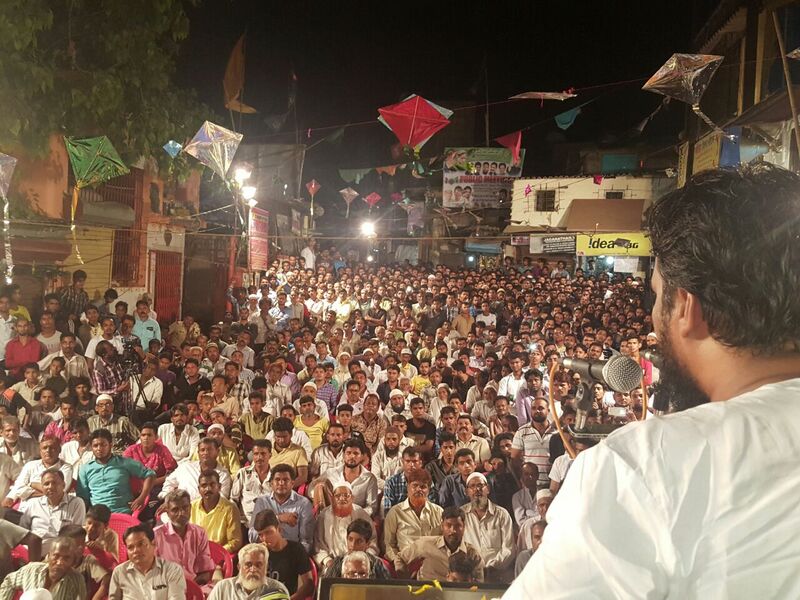 Mumbai: The public meeting of All India Majlis-e-Ittehad-ul Muslimeen was held at Yalappa Ground, Jarimari, Mumbai. All senior party leaders, members and thousands of local people were present. The meeting held in Jarimari saw participation of Sayyed Moin (President, AIMIM Maharashtra), Abdul Rehman Patni (President, AIMIM Mumbai), Adv. 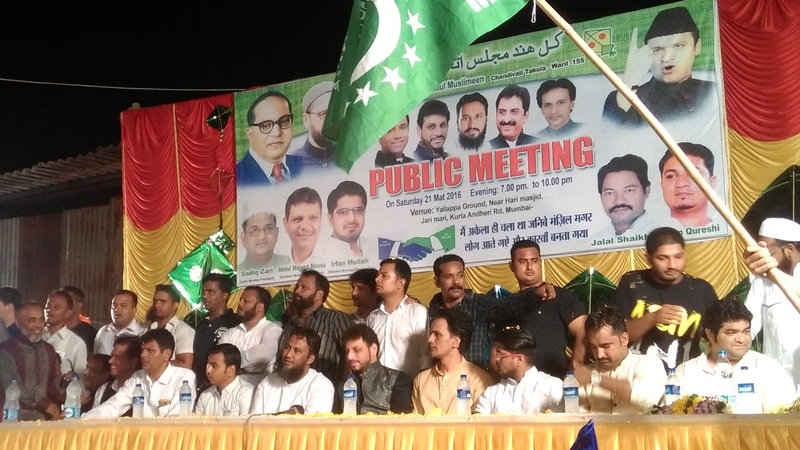 Waris Pathan (AIMIM MLA, Byculla ), Aabid Sayyed (AIMIM Gen. Secretary, Mumbai) and other senior members Saeed Moosa, Abdul Majeed, Ekhlaque Khan, Sadiq Zari and Raees Shaikh etc. Public meeting was organised by Imran Qureshi along with active members Arif Qureshi, Ameer Inamdar, Jalal Shaikh and Waqar Chaudhary. 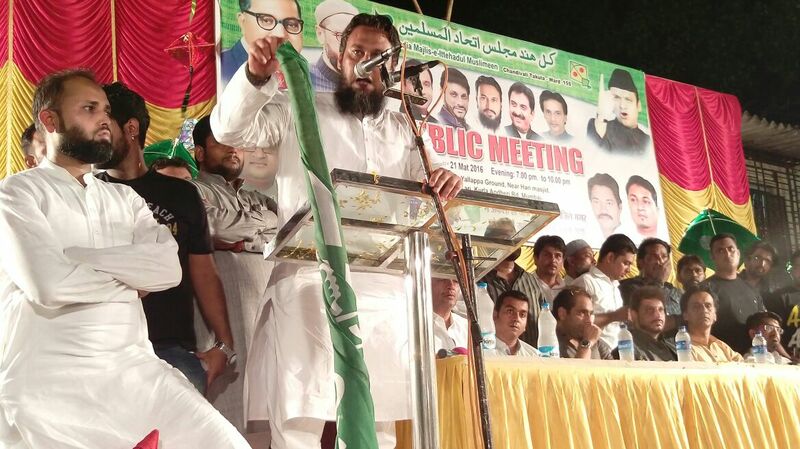 Aabid Sayyed (AIMIM Gen. Secretary, Mumbai) challenged congress leader Arif Naseem Khan that AIMIM will defeat him in upcoming elections in his constituency. 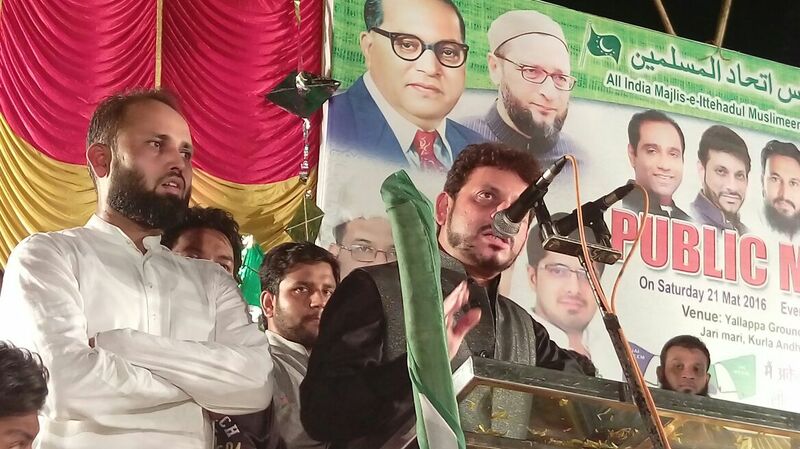 Abdul Rehman Patni said that party is striving for the welfare of Muslims, Dalits, backward classes and downtrodden communities in the region and to provide an alternative platform for the minorities and the oppressed classes. Sayyed Moin praised owaisi brothers for development and upliftment of Muslims, Dalits, backward class people etc. He also raised point of innocent muslims arrested by ATS across India without any proof and demanded government to take action against those ATS officers. Waris Pathan presented his experience about how he was pressurised and threatened from all the parties including BJP, Shiv Sena, Congress, NCP and Samajwadi to chant ‘Bharat Mata Ki Jai’ in Maharashtra Assembly after he refused to chant it. Pathan said, “I love my country, I was born here and I will die here. He also raised point of children’s education, beef ban law in the state and requested all party members to be united for strengthening the party and not to afraid from anyone. He asked Jarimari citizens to be united and vote for AIMIM party and if they have any local issues they can approach him at any time. He congratulated all party members for their hard work, active participations in AIMIM activities, making events and programmes more successful and understanding their social responsibilities.